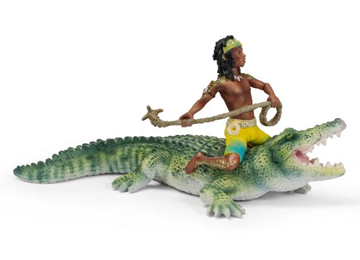 Schleich 70444 - Kenjok is the lord of the great crocodile in the river. Kenjok is the youngest of the heroes and is very friendly and charming. He is a master of the crocodiles and has chosen a magnificent looking crocodile to accompany him not only because of its bone crushing bite, but also because he can be his faithful protector for up to fifty years.